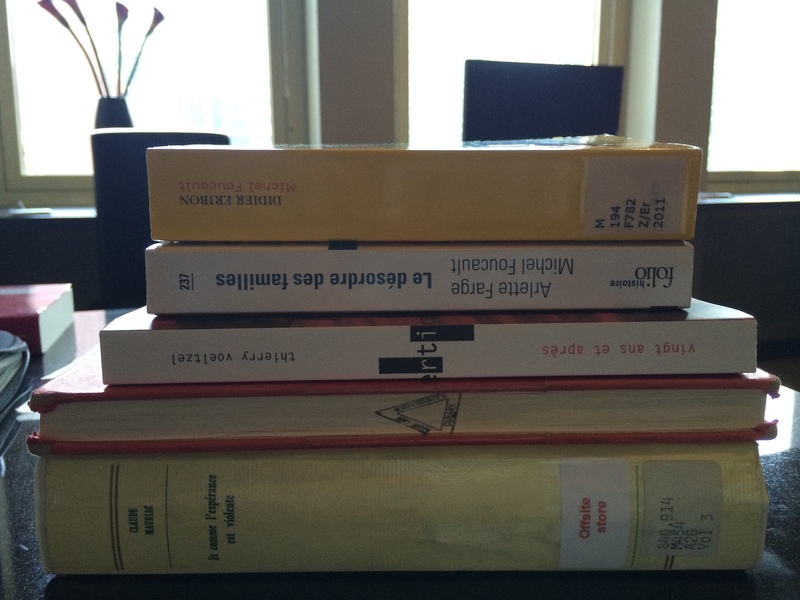 Since I arrived in Melbourne I’ve been working on the complete manuscript of the Foucault book, and I’ve made use of the libraries of Monash University, State Library of Victoria and University of Melbourne. One thing that the University of Melbourne has, which is useful for this work, is all ten volumes of Claude Mauriac’s memoirs, Le temps immobile. Mauriac was a close friend of Foucault’s for many years, and his memoirs are a non-linear, loosely thematic set of excerpts from his journal. David Macey and Didier Eribon make quite a bit of use of them in their biographies of Foucault, and so there were a few citations I wanted to check. But Clare O’Farrell encouraged me to “well and truly scour” them, which I have been doing. Entries are dated, and there is a decent index, so I was able to skim over parts outside the period I’m concerned with – he kept journals for nearly sixty years. Even so, each volume is around 500-600 pages, so this is a lot of work, but they include some very interesting anecdotal information and some useful insights. I also worked through the recently-reissued book by Thierry Voeltzel, Vingt ans et après, which is a set of interviews, initially anonymous but which we now know to be with Foucault, and is very revealing. I then re-read the Miller, Macey and Eribon bibliographies and was struck how Macey especially was able to fill in detail about the courses on the basis of what was then pretty scant evidence. My book is very much about Foucault’s work and not his life, though in terms of his activism and working practices that line is blurred; and largely about his work rather than the secondary literature. The books I’m reading or rereading at this stage are mainly ones that might tell me something that I couldn’t find out from reading Foucault himself. In that respect it’s often the information the biographers got from their interviews that has been most helpful. Eribon’s has a few interesting pieces of documentary evidence, and I decided I need to check all the quotes from that back to the original French version. I have a copy of the second edition back in England (this edition was the basis for the English translation), but there is a new French third edition from 2011. I’ve checked all the quotations to that new edition – there are some parts revised and lots of additions. It also includes some interesting documentary evidence in appendices, some of which was familiar – Foucault’s candidacy presentation to the Collège de France and Canguilhem’s report on his doctoral thesis; and some of which wasn’t – notably, the Collège de France documents for the creation of his chair and his election to it. I will make time to read the entire new edition. I then went through the whole manuscript, tightening up the argument, reducing the length of the quotations, and adding references and filling in details. I did a bit more work on the ‘lettres de cachet’ section, initially by reading Frantz Funck-Brentano’s 1926 book, Les lettres de cachet, and also looking at some other work by Arlette Farge. As well as Delinquance et criminalité: Le vol d’aliments a Paris au XVIIIe siècle, which Foucault cites in Discipline and Punish, he was also impressed by Vivre dans la rue à Paris au XVIIIe siècle. Her contribution to Histoire de la vie privée makes use of some of the documents Foucault had collected, which were not used in their collaborative book. Farge’s essay “Travailler avec Michel Foucault”, from Le Débat in 1986 gives an interesting insight into what it was like to collaborate with him. The collaborative nature of Foucault’s work is something I’ve tried to really emphasise in this book – from the Pierre Rivière work, to the CERFI projects, others out of Collège de France seminars, the work at Louvain with Françoise Tulkens, and this final one with Farge. I still want to work through the Farge and Foucault book again, which is complicated by the new edition being revised. Who by is not clear: obviously not Foucault, so presumably Farge? This might lead to some more work. Of course, reading the biographies again threw up a whole host of things to check or find. Every time I think I’m getting close to completing the ‘to do’ list of minor things, I add more to the bottom. In particular, though, I have made good progress with tracking down some of Foucault’s more obscure texts. Dits et écrits is a superb resource (and there really should be a full English translation), but it is not complete. There are texts missing that were published in Foucault’s lifetime, and therefore should have been in place; and a number of post-June 1984 pieces which the editors decided not to include, given the ‘no posthumous publications’ stipulation. These include ones that appeared very soon after his death, and more recent ones that have often been authorised by the estate. Foucault’s own wish was for a while followed faithfully; then interpreted generously; and is now almost completely disregarded. As previously mentioned I’ve put a page on this site which links to many of the non- Dits et écrits pieces which are available; and made a list of requests of pieces I’ve yet to locate. Many thanks to readers who have helped with locating some of these texts already – it is much appreciated. So, quite a lot of work done on the manuscript; a lot left to do. This entry was posted in Foucault's Last Decade, Michel Foucault. Bookmark the permalink.